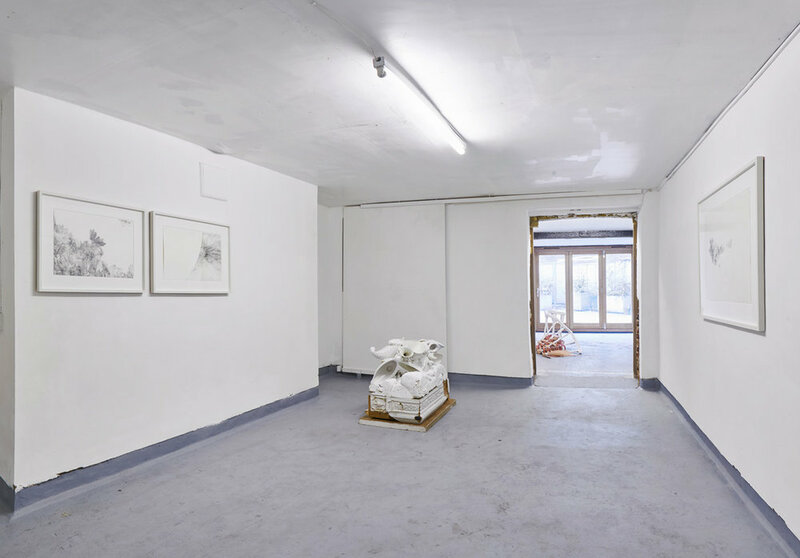 The drawings explore form in two dimensions and usually involve ideas generated by the three dimensional installations. The current series began as a way to look at a phenomena observed in the Dendrite installations. Visitors commented that the threads of this installation could be perceived in two ways: either as solid lines in space, or as the division lines between imagined planes. The drawings worked with that ambiguity. The drawings use a process which was developed to express non-figurative form and create visual depth. Systematic, flowing lines gradually build form which responds to feedback from its own growth and to the lines/spaces. When the straight lines/spaces are made into curves, circular forms result. These have a distinct planetary appearance in which aspects of scale and visual gravity become evident. In later work the structural lines are no longer included and the forms which emerge are the product of their own process.